I don't even know. But I can't access anything that is stored on the internal storage as it's decided to die one me. Awesome! Especially since I can't do anything about it for 3 weeks. Popped up to Exeter though to get HD Brows, post on that later. Met Charlie, she's awesome - of course! 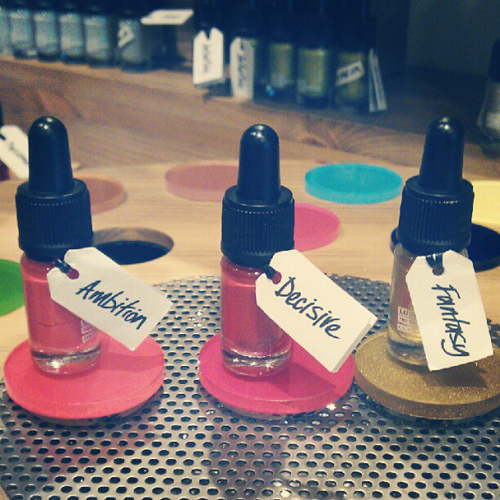 Checked out the new Emotional Brilliance line from Lush and had a 'reading' (is that what you call it?) done. Can't remember what the guy said about the first one, oops. But right before I did it I was on about how scared I was to do it because I hate making decisions and I feared no colours would stand out to me. Of course 'Decisive' came up, which he said I needed to do more. Not to think something over, just do it. Both 'Ambition' and 'Fantasy' are just in general I think, about having dreams and working hard to get those goals. I really liked it though and the colours they've come up with are so so nice! I want them all, pretty much.